My husband got the pleasure of reviewing this SPIband from SPIbelt. It goes around your arm and can hold something as small as a key or as big as a cell phone or and Ipod! My husband liked it a lot and thought that it was easy to run with. The only thing that he thought made it harder to use was that it is kind of long along your arm which may get irritating for running with. The cost of this is $19.95 and can be purchased on their website and they even are offering free shipping right now! The new SPIbandTM is designed with the same guarantee as the SPIbelt, it does not bounce, and it’s much roomier than it looks. Perfect for those who like to carry their iPodTM, GuTM packs, phone, keys, etc. around their arm while running or doing other activities. Fits snug yet comfortable and is a great way to store personal items. What I have to say: The band seems to be great quality and I love that it can fit around small things or larger things like a phone. This can be very helpful when running to be able to bring whatever you need with you. 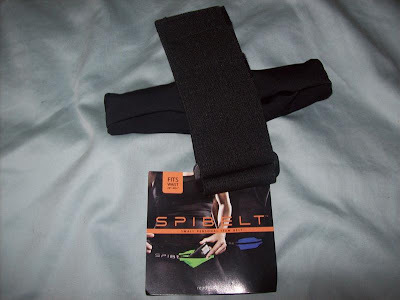 Also, the company's main product that they sell is a SPIbelt which is pretty much the same thing as the SPIband. This seems great too but I did not think that my husband would wear it so I chose the band. 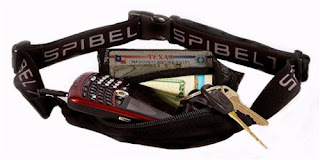 The giveaway will be for one SPIbelt (a $20 value) for one lucky reader! The giveaway is open until Midnight on Friday September 10th. Winner will be chosen on Saturday September 11th using Random.org. Let me know what kind of physical activity that you or your family enjoys doing! Hi, I've been following your blog for a little while now. This SPIbelt looks fantastic and would make carrying my iPod so much easier while hiking! I don't really enjoy but am trying to start running, so I'd love to have a band to put my ipod in! I walk my dog every morning. We try to do at least a couple miles, but often do more. I am often frustrated by how difficult it is to carry the few necessities with me without being weighed down by them. This would be a huge help! I entered the Toilet Tree giveaway. I entered the Creations by Shelley giveaway. The kind of physical activity my family and I enjoy doing is walking or having swim days at the ocean. We do that quite frequently! I found your site from GS, but I have been following you ever since. I entered your GU Energy Sampler giveaway. I also entered the Wheatgrass giveaway! my family and I love to take hikes together at a fast pace. we like to go on this one hike that is almost climbing straight up this rock that takes you to look over the city of Leavenworth. Its very nice. Boy does it work you out! Well, my boyfriend and I are starting to go running in the evenings, so this would be great! My husband and I enjoy playing tennis, but if I won this I would use it while jogging around the neighborhood. My family spends a lot of time walking around disney. It's not a lot of exertion, but it's what we can do right now with an infant. We are a big family of runners- marathons, half marathons, 50 milers - yes we're crazy!